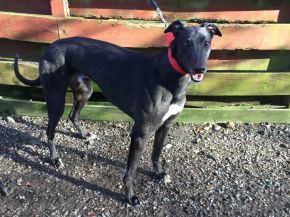 MAJOR is a gorgeous, black dog who has a flash of white on his chest. He is good natured and calm and loves when someone chooses to spend time to talk to him or scratch him behind his ears. As you can see from the photo, he is a smiley boy and his favourite thing is to go on walks with you where he walks really well on lead. He is at his happiest sniffing around and enjoying being outdoors. He is very clean in his kennel too. He loves company but will lie peacefully in bed, watching everyday life around him. He will be a wonderful, joyful boy to have in your home.